Update (7.8.2009): Fixed some errant quote mark substitutions in the freetype configure line. Also corrected a tab formatting error in the freeimage makefile. Ok, here goes. This is going to be a work-in-progress document. Of course, there are no promises with this and your mileage may vary…but it’s been working for me. Please report success (and trouble, hopefully with workarounds). I’d highly suggest following Memo’s tutorial for setting up the development environment. However, there are three libraries that he mentions in his article that need to be built for the iPhone specifically: glu, freetype and freeimage. Although he mentions that they have been ported to iPhone I wasn’t able to locate binaries of the libraries, and went through the process of cross-compiling them myself. This post documents what I needed to do to accomplish that. You’ll need to download the source for each of the libraries listed above, as well as a svn copy of open frameworks plus the ofxiPhone, ofxMultiTouch and ofxAccelerometer addons. I preferred to use ofx-dev which bundled this and many more addons. You also need the Apple Developer Tools including Xcode and the iPhone SDK. The other two were more difficult for me. I’ve never cross-compiled, so perhaps that contributed to the trouble I had. ./configure --prefix=/usr/local/iphone --host=arm-apple-darwin --enable-static=yes --enable-shared=no CC=/Developer/Platforms/iPhoneOS.platform/Developer/usr/bin/arm-apple-darwin9-gcc-4.0.1 CFLAGS="-arch armv6 -pipe -mdynamic-no-pic -std=c99 -Wno-trigraphs -fpascal-strings -fasm-blocks -O0 -Wreturn-type -Wunused-variable -fmessage-length=0 -fvisibility=hidden -miphoneos-version-min=2.0 -gdwarf-2 -mthumb -I/Developer/Platforms/iPhoneOS.platform/Developer/SDKs/iPhoneOS2.0.sdk/usr/include/libxml2 -isysroot /Developer/Platforms/iPhoneOS.platform/Developer/SDKs/iPhoneOS2.0.sdk" CPP=/Developer/Platforms/iPhoneOS.platform/Developer/usr/bin/cpp AR=/Developer/Platforms/iPhoneOS.platform/Developer/usr/bin/ar LDFLAGS="-arch armv6 -isysroot /Developer/Platforms/iPhoneOS.platform/Developer/SDKs/iPhoneOS2.0.sdk -Wl,-dead_strip -miphoneos-version-min=2.0"
./configure --prefix=/usr/local/iphone --enable-static=yes --enable-shared=no CC=/Developer/Platforms/iPhoneSimulator.platform/Developer/usr/bin/gcc-4.0 CFLAGS="-arch i686 -pipe -mdynamic-no-pic -std=c99 -Wno-trigraphs -fpascal-strings -fasm-blocks -O0 -Wreturn-type -Wunused-variable -fmessage-length=0 -fvisibility=hidden -mmacosx-version-min=10.5  -I/Developer/Platforms/iPhoneSimulator.platform/Developer/SDKs/iPhoneSimulator2.0.sdk/usr/include/ -isysroot /Developer/Platforms/iPhoneSimulator.platform/Developer/SDKs/iPhoneSimulator2.0.sdk" CPP=/Developer/Platforms/iPhoneSimulator.platform/Developer/usr/bin/cpp AR=/Developer/Platforms/iPhoneSimulator.platform/Developer/usr/bin/ar LDFLAGS="-arch i686 -isysroot /Developer/Platforms/iPhoneSimulator.platform/Developer/SDKs/iPhoneSimulator2.0.sdk -Wl,-dead_strip -mmacosx-version-min=10.5"
Run one of the configure lines, then make. I got an error about “asm” being undefined…I think it was in include/freetype/config/ftconfig.h. Change “asm” to “__asm__” (that’s two underscores for both prefix and suffix). If it works then it drops the lib in a hidden dir: “./objs/.libs”. Copy the static lib out of there and rename it as appropriate. i’m using libfreetype-iphone.a and libfreetype-iphonesimulator.a. Run make clean and then run the other configure line and make again. There were some headers missing in from the freetype lib provided with ofx-dev that I noticed in the example ofxiPhone aps…so I copied the entire freetype folder to ofx-dev/libs/freetype-iphone. 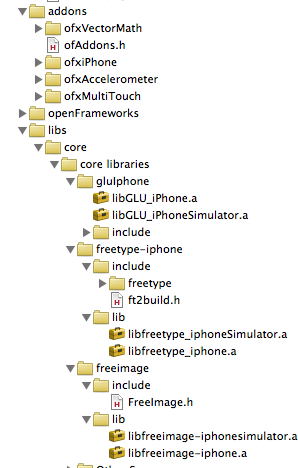 I put the libraries into freetype-iphone/lib so i could keep everything straight when setting up xcode. Ok, I think this gets up to the point where we can set up xcode. Copy one of the ofxiPhone examples to ofx-dev/apps/dev and open it up in xcode. I used the Graphics example. There is some more explanation on Memo’s site about the project structure, but it was very similar to adding any other addons. 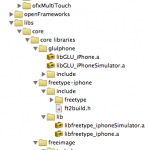 However, I put gluiphone, freetype-iphone and freeimage into the libs>core>core libraries package in the xcode project. I’ve attached a screenshot to illustrate better than i can explain. 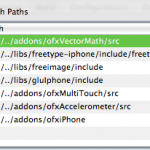 (ofxVectorMath is there for the specific project i have open, is not required). Go to menu Project>Edit Project Settings… and switch to the build tab. Set configuration to “All Configurations” and add in the library and header search paths as appropriate…just like setting up addons. Set the Overview to Simulator – 2.0 | Debug and try to build. Make sure that all the appropriate libraries have been added to the Target. xcode seems to be able to pick the correct ones for the given architecture. I initially got an error about a bad BOOL typedef in FreeImage.h:130 I changed it to typedef int8_t BOOL. In perhaps a separate issue, I don’t seem to be able to use the “Boolean” datatype, but can replace it with “bool” instead. So, that’s what I did to get my system all set up to use openFrameworks with the iPhone. Feel free to let me know how it works out if you use this for yourself. Good luck! This entry was posted on Wednesday, March 25th, 2009 at 23:09	and is filed under iphone. You can follow any responses to this entry through the RSS 2.0 feed. You can leave a response, or trackback from your own site. have you been able to compile freetype2 for the iphone? xcode is telling me that the resulting library has no armv6 arch intstruction when using almost the exact same configure as above. No, I haven’t tried. Since openFrameworks 006 was released I haven’t tried compile the libs again. Thanks for the file. It saved me tons of time! Thanks for the catch…I’ll fix the makefile.